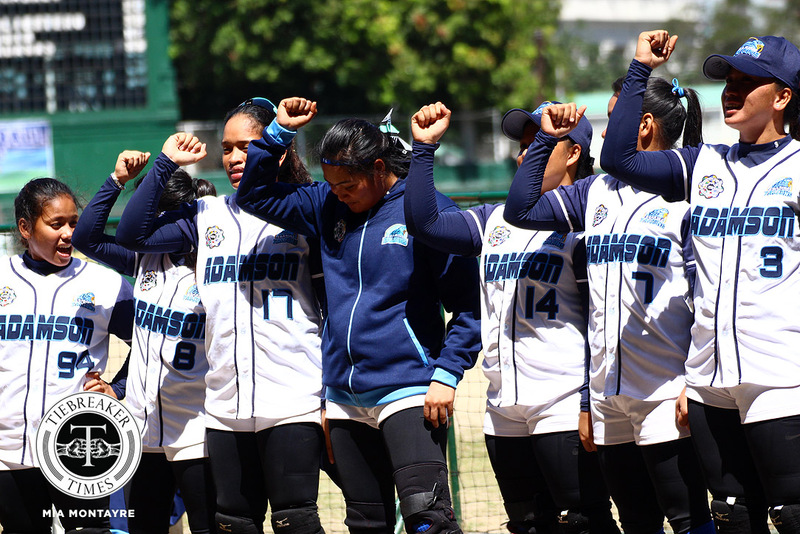 Great teams find a way to win and the reigning, eight-peat UAAP Softball champions Adamson University Lady Falcons are no different. Leaning on ace pitcher Lyca Basa’s solid deliveries and their heads-up defense, the Lady Falcons fended off the challenge of the National University Lady Bulldogs, 2-1, to book their ninth consecutive Finals berth, Saturday morning at the Rizal Memorial Baseball Stadium. With a precarious 2-1 advantage going into the final inning, the defending champs just needed three outs to formalize their entry into the last dance. With this, head coach Ana Santiago told her wards to remain focused and they will eventually get the win. Fortunately for the Falcons as well, they faced the middle portion of National U’s batting order. Adamson took the early lead in the first inning after last year’s home run queen Jeanette Rusia sent the ball to deep right and scored Nichole Padasas. The latter shortstop earlier reached first on four balls before getting into prime scoring position off a passed ball, advancing her from second base to third. The Lady Falcons’ day has been a struggle despite the 1-0 lead and they got a reprieve in the fourth inning after they produced another run. Angelu Gabriel was instrumental in this point as she drove in a hit into the center. Rookie Christy Arribas attempted a catch, but fumbled the ball, eventually letting Nichole Padasas cross the plate for a 2-0 cushion for the Falcons. National U then sliced the deficit in the following inning after two high pitches met the Bulldogs’ bat. Nicole Ordoyo took the first of these pitches and drove in the ball in between the second and first basemen to get to first base. Senior Elsie Dela Torre then capitalized on another rising ball and blasted it to the left field to send Ordoyo home. Adamson then retired the side to go into the final innings with confidence. The Lady Falcons then heeded their mentor’s request and finally secured their place in yet another Finals series. That very same composure is what the seasoned coach Santiago felt was the most important lesson they gained throughout their journey so far. “Sa tingin ko natutunan nila na ‘pag ‘di umaayon sa kanila ‘yung situation, huwag silang magpa-panic at kaya nilang manalo. “It’s a matter of believing that they can and they will,” the decorated mentor furthered. Basa finished the game in a no-relief effort, allowing National U a solitary earned run in five hit and fanning six of the 25 batters she faced. Senior Rusia showed up for the Lady Falcons, getting two hits in three at-bats with an RBI. Adamson awaits the winner of the other semifinals series between the De La Salle University and University of Santo Tomas. Game 1 of the Finals is scheduled on Friday, March 29 at 9 a.m.